Ukraine’s head of state Petro Poroshenko appointed former Georgian President Mikhail Saakashvili as his non-staff advisor, according to a new decree. Saakashvili is wanted for trial at home, as he is accused of corruption and brutality against protesters. According to Poroshenko, the controversial Georgian politician, who is currently based in the US, will head the Advisory International Council of Reforms. The organization’s main goals will be developing proposals and recommendations for implementing reforms in Ukraine based on best international practices. The council will invite foreign experts to work on changing the Ukrainian legal system as well as to boost international support for Ukraine. “Mikhail will become a Ukrainian representative abroad and, at the same time, will represent the foreign community in Ukraine. We are confident that he will be able to establish two-way communication between Ukraine and the rest of the world,” Poroshenko said. This is not the first time the Ukrainian president has turned to foreign nationals for help. In fact, since he took office, Poroshenko has been surrounding himself with a team of foreign assistants. In December, he confirmed granting Ukrainian citizenship to US, Georgian and Lithuanian nationals, who were appointed for Cabinet jobs. One of them included the US-born Natalie Jaresko, who has taken the post of Ukraine’s finance chief. Saakashvili served as Georgia’s president from 2004 to 2013. His time in office was criticized by the opposition for authoritarian tactics. 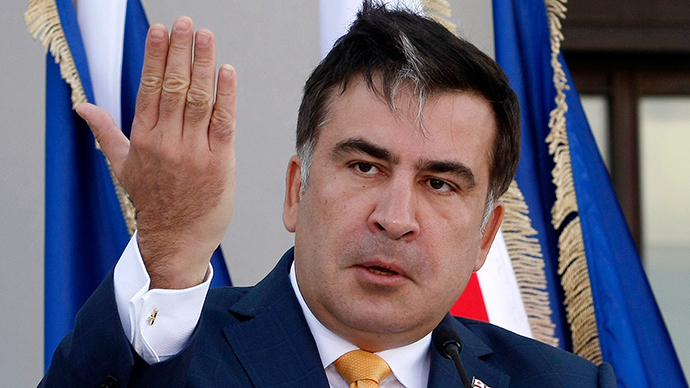 Since his presidential term ended, Saakashvili has been living in exile in the United States. At home, the 46-year-old faces numerous charges stemming from his time in power. The former president had his assets frozen by a court in Georgia back in September. The order included his bank accounts and property belonging to both him and his family. On top of that, he faces corruption charges. Moreover, Georgia’s Chief Prosecutor Office launched proceedings to indict Saakashvili and place him on the international most wanted list in August. The charges relate to abuse of office during his time as president, when hundreds of opposition protesters were brutally beaten in November 2007. 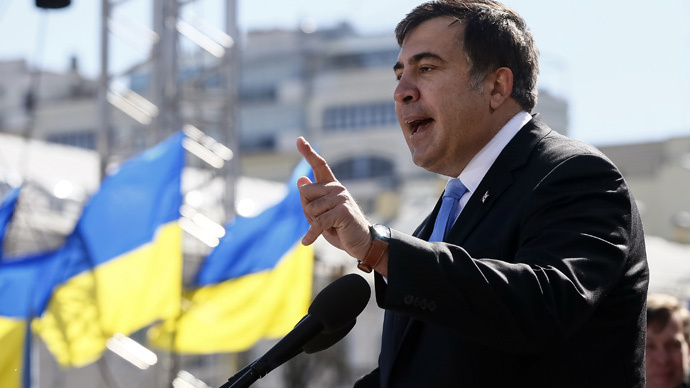 The protesters were demanding that Saakashvili step down and for early elections to be held. Saakashvili’s trump card during his time in office was his strong anti-Russian and anti-Putin rhetoric, which garnered heavy US support. It reached its peak when Georgia launched the August 2008 offensive against South Ossetia, where Russian peacekeepers were stationed under the CIS peacekeeping agreement. Hundreds of civilians and more than ten Russian peacekeepers were killed in the initial heavy shelling of the South Ossetian city of Tskhinvali on August 8, which prompted then-Russian President Dmitry Medvedev to order a military operation to “enforce peace” in the region. Saakashvili claimed the conflict was a “Russian aggression” and Western media started covering the fighting only after Russian forces reportedly crossed the Georgian border, with footage of Georgian missile launchers shelling Tskhinvali presented as a Russian attack by a number of US channels. 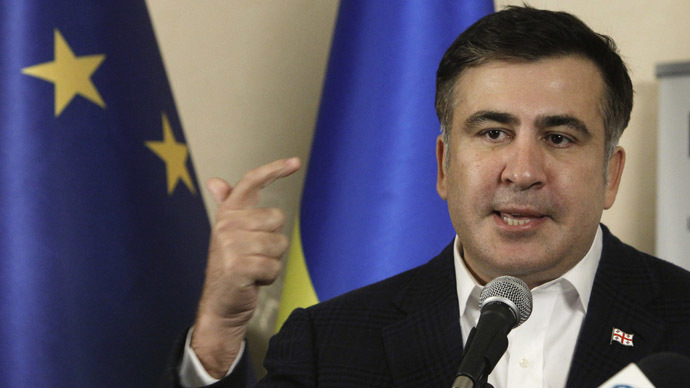 Saakashvili has since advocated his version of events in speeches and essays. However, the findings of a 2010 EU Independent Fact Finding Mission Report made it clear that Tbilisi was responsible for the start of the Five-Day War, which it provoked by using excessive (“not proportionate”) force in the attack on Tskhinvali.